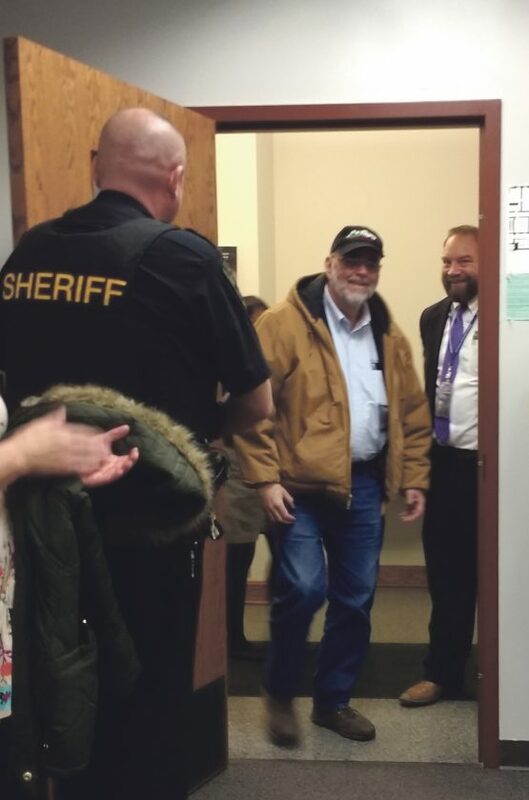 Times Observer by Lorri Assistant District Attorney Richard Hernan entered the office of Crime Victims Program of A Safe Place on Thursday for what he thought was a birthday party for a colleague. Hernan was instead recognized for his many years of dedication to the office. A plaque will hang outside the office in the Warren County Courthouse in his honor. “I’m rarely at a loss for words,” Hernan said after the realization sunk in that he wasn’t there for a birthday party. Hernan was recognized for his many years of dedication to victims of crime in Warren County. The Warren County Victim Witness Program was started by Hernan in 1986. The surprise occasion came with a lots of hugs, some tears and a few official proceedings. District Attorney Rob Greene presented Hernan with a plaque in his honor. A duplicate plaque will be hung on the wall outside the office of Crime Victims Program of A Safe Place in the courthouse. Warren County Commissioner Ben Kafferlin read a proclamation adopted by the commissioners designating this week as Crime Victims’ Rights Week. Following the proclamation, Terri Allison, executive director of A Safe Place, told those gathered that in addition to recognizing the significance of the week it was also the perfect time to recognize Hernan. Allison said her life had come full circle as she started her career as a part-time secretary in the District Attorney’s Office in the Sexual Assault Aid Center. Allison was there when Hernan started the program and said she never dreamed she would be directing it some day. “We honor you today not only for your dedication to this program but also for more than 40 years in public service as a paramedic and firefighter,” Allison told Hernan.